The fundraising page for Team Levi in the year of 2017 is open now. Levi is Jensen’s nephew who has Down Syndrome and who is member of the Down Syndrome Guild of Dallas. Every year a page to receive donations is created and usually the donors receive a thank-you letter and a signed photo of Jensen with Levi. This year the goal is $20 000. Send your donation here! 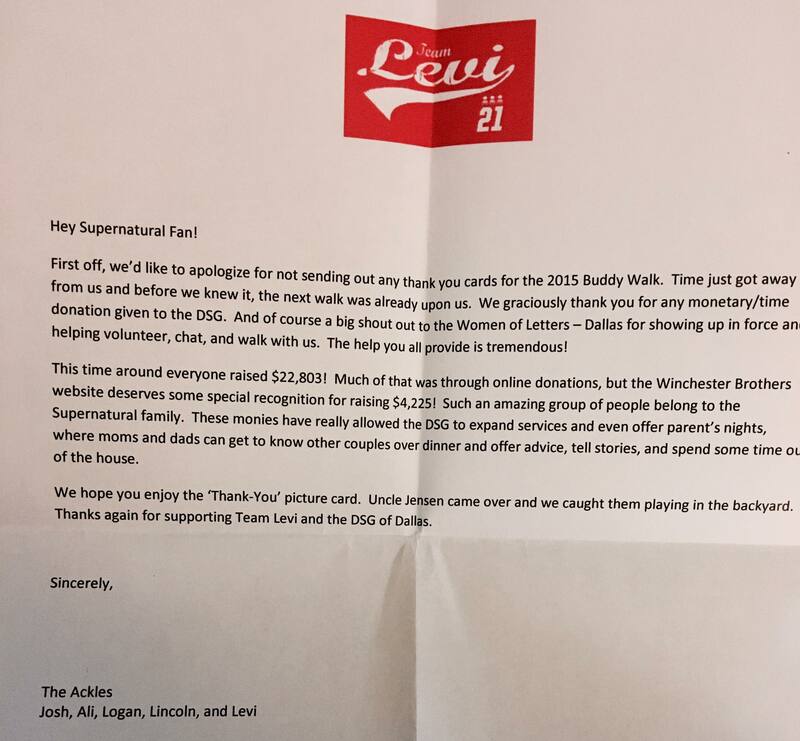 Jensen’s family already sent the letter thanking the donations to Team Levi (team which supports Jensen’s nephew who has Down Syndrome) in the year of 2016. As usual, a new signed photo of Jensen with Levi came with it. 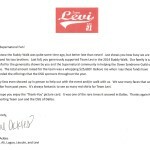 The donations page for Team Levi is already available. This page aims to give support to Jensen’s nephew, Levi, who has Down Syndrome and this year its goal is $50 000. Every year, the donors receive a thank-you letter and a signed photo of Jensen with Levi. Be free to make your donation here! The donations page for 2015 Team Levi is already available. Their goal is $25 000 to help Jensen’s nephew, levi, who has Down Syndrome. The donors usually receive a thank-you letter and a signed photo of Jensen with Levi. Make your donation here! The donations for Team Levi (team who supports Jensen’s nephew with Down Syndrome) of this year will end soon. Those who donated are receiving the usual thank-you letter and the signed photo of Jensen with his nephew Levi. Down Syndrome Guild of Dallas is receiving again donations to Team Levi, that aims to help Jensen’s nephew who has this genetic condition. Click here to donate. Jensen’s brother, Joshua Ackles, published on his twitter a picture with Levi and Jensen at Buddy Walk. @josh_ackles: Levi smiling as usual, and uncle Jensen walked too. Thank you #spn family/volunteers for all you do for us! Buddy Walk, organized by Down Syndrome Guild of Dallas, with the purpose to help promote acceptance and inclusion of people with Down syndrome, happened yesterday. 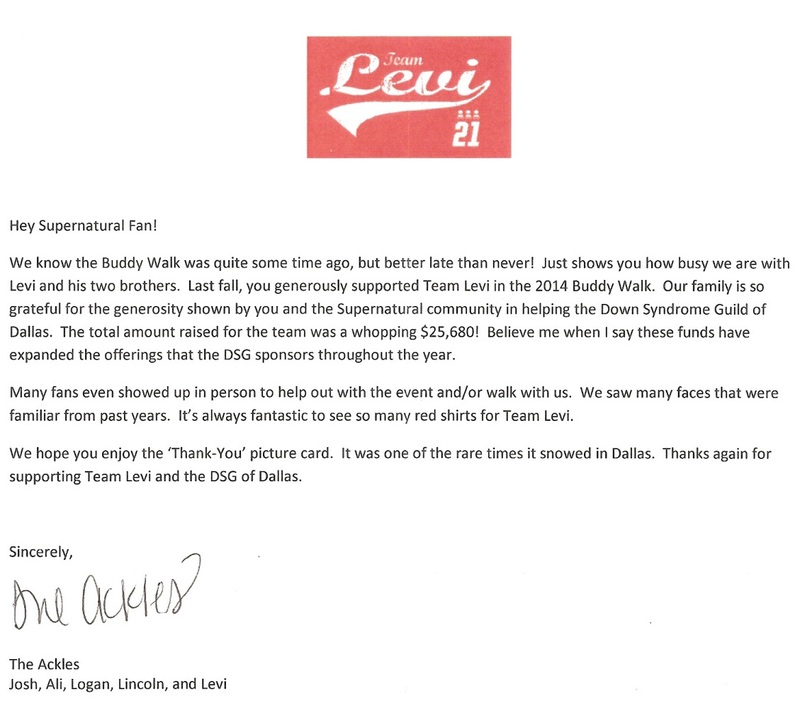 This year, Team Levi, the support team to Jensen’s nephew, was strongly represented by his family and Supernatural fans, as you can see in the shared picture. 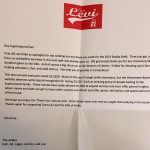 With the help of t-shirts sales, the donations for Team Levi reached their goal. To donate click here. The donations page for Team Levi in year 2013 was finally released. The page belongs to Down Syndrome Guild of Dallas and their goal is reach $30.000. You can send your donations here and read all news about it here. A photo with Jensen and his nephew Levi was released by some fans in their social networks. The picture has been part of the Down Syndrome Guild of Dallas campaign, which support children with Down Syndrome. @SupportSPN Just got this in the mail. Could this man be any more gorgeous?